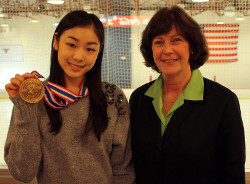 Olympic figure skating champion Yuna Kim of South Korea received the United States Sports Academy’s 2010 Female Athlete of the Year Award at her training facility in Artesia, Calif. this past weekend. The presentation was made by former Academy trustee and women’s sports advocate Dr. Judith Sweet. Yuna, the world’s No. 1 figure skater, dominated the voting after she won the ladies’ singles gold medal at the 2010 Winter Olympics and became the first female skater to surpass the 200-point mark under the International Skating Union judging system. The voting was conducted on a worldwide online ballot in cooperation with USA Today and NBCSports.com. Dr. Sweet serves as a consultant on Title IX and gender equity strategies for the NCAA, the organization where she spent six years working as vice president for championships and senior woman administrator. She was also the first female president of the NCAA for two years during her 25-year tenure as director of athletics for the University of California-San Diego, where she was one of the first women in the nation to direct a combined men’s and women’s intercollegiate athletics program. Yuna, who was also named Sportswoman of the Year by the Women’s Sports Foundation, also won the World Championships, ISU Grand Prix Final, ISU Grand Prix Skate America and ISU Grand Prix in 2009. She won the silver medal at the World Championships in 2010, the fourth World Championship medal in the 20-year-old’s four-year career in the senior circuit. The Athlete of the Year ballot is the culmination of the year-long Athlete of the Month program, which recognizes the accomplishments of men and women in sports around the globe. The Athlete of the Month is selected by an international voting committee comprised of media members and representatives of sports organizations and governing bodies.